Are you going to add the helmet cage? I think it would make a cool "optional skin" but too distracting for the main player model. So I'll make one and post it here, eventually. I think it would be cool to have other downloadable skins too, like how the Spider-Man and Batman Arkham games do it. For instance, there could be a Keen Dreams skin, one where he's wearing the Vorticon medal from Keen 3 or him wearing the "Goodbye, Galaxy!" shirt. Even GBC Keen! Then eventually I could make a season pass, and not include about half a dozen skins in it! I textured the 3D model, added a face guard (as per request of VikingBoyBilly) and I also made some minor changes in the actual model. For instance I made the top part of the helmet more round, and surprisingly this made things look much more like Keen from the 4-6 title screens. This box art made for a very important reference I used to do Keen's pants, shoes and even shirt (I liked the "sweater collar"). For the face guard, I took inspiration from the ending to Keen 3. 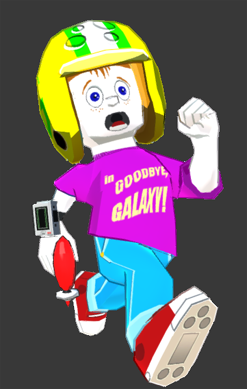 When I do more skins for Keen64, I'll make a variant with his shirt tucked in and belt showing, but for now the Galaxy box art showed him with his shirt untucked. Also, I might remove the dents for the final model in Keen64, since it might have not been so dented on Keen's first run into space. I also thought I'd use the same image to show off the wristwatch, which I adapted directly from the Keen 4 title screen and menu. Lastly, there's no lighting in this actual scene, and some of the parts where it shows shading-- like under the arms and on the neck might be removed if it looks weird in Unity's lighting. Last edited by Lava89 on Fri Apr 21, 2017 20:19, edited 1 time in total. Nice work. The oversized helmet is much more obvious with the guard. The wrist computer looks cool too. The helmet may have been undented in vorticons (man, the endscreen shows it wasn't even damaged by the end of Keen 3! So when did it happen? ), but I'm pretty sure the writstwatch wasn't invented then, either (paddle wars is a keen 4 addition). Never mind the forum banner that shows him with both the face guard and the watch. Are you thinking far ahead enough to make Goodbye Galaxy 64? The 3D angles really shows off the helmet's bigness. Nice work! I'm more of a fan of the brown star pattern on Keen's helmet, but heck, this just looks nice. I like the EGA version a little bit more. I have a new theory that the "brown star" is a football accident his brother had at one of his games. Keening_Product wrote: Nice work. The oversized helmet is much more obvious with the guard. Thanks! Yeah, I tried to match the size of the helmet to the ratio of his head from the title screens as best I could. DaVince wrote: Nice work! I'm more of a fan of the brown star pattern on Keen's helmet, but heck, this just looks nice. I like the EGA version a little bit more. Yeah, I was actually planning to include both, since that is what is shown in the box art \ title screens. But by the time I took the pictures I forgot about it in the texture and didn't bother (for now), since I didn't even know if I'd keep the dents for the main player skin in the game. But I'll definitely include them for the Keen Galaxy skin. That's good to hear about the EGA one. I want to do skins so the game will cater to more audiences, as well as just being fun. VikingBoyBilly wrote: the endscreen shows it wasn't even damaged by the end of Keen 3! Yeah, it could be a case like the Kingon's head-ridges from Star Trek, where it's just something that wasn't thought about till later. Also, looking at Billy's helmet in the story sequences they show no dents, due to the fact it's "zoomed out", so it could also be the case in the Keen 3 ending. Even the opening crawl for Keen 4 says that the events between Keen 3 and 4 are just a few months, which isn't a whole lot of time, if the Keen 3 ending is being accurate. VikingBoyBilly wrote: So when did it happen? The only logical explanation is Keen Dreams! VikingBoyBilly wrote: Are you thinking far ahead enough to make Goodbye Galaxy 64? 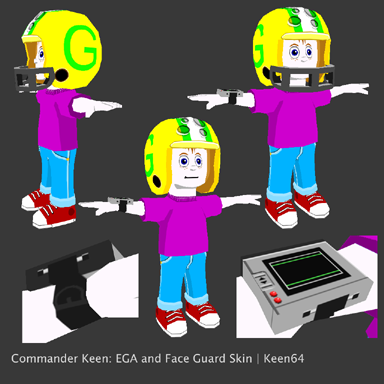 Possibly-- I want to do Galaxy skins and I would like to make a model pack and release it to the community, for whoever wants to take on something like that with the development materials from Keen 64. I've also made Galaxy styled models in the past (I admit the BWB needs to be more accurate and I need to give them proper cel-shading....I'd also make a few of the collectable items). Thanks for the feedback, everbody! 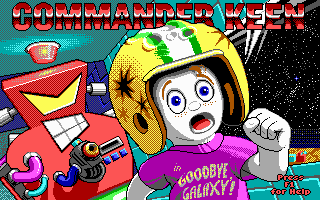 Commander Keen 64 in Goodbye Galaxy! 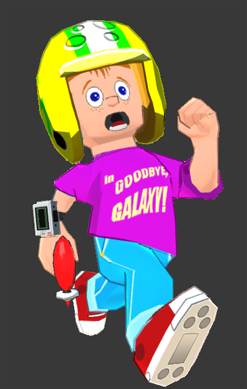 Having seen Romero post that Keen 7 demo, kind of inspired me to work on some stuff related to Commander Keen 64, so I thought I'd rig my new model and what better way to test it out than to see if I could replicate Keen in his running pose from the Goodbye Galaxy box art and Keen 5 title screen. I still need to add a lazerbolt texture to the gun and I would like to put Robo Red in the background. That's pretty dang sweet, mate. Well done! Yay this is still being worked on! I first played the beta demos a couple years ago, and it was amazing! Especially considering it was just a beta. Everything was 3Dified really well. The physics were a bit weird but I suppose that's a side effect of being a beta. I really, really hope this will be done someday. I just reread this whole thread and the screenshots all look really promising. That new Keen model looks much better than the old one, fits more with the cartoony style. (If you want a little constructive criticism, it seems like Keen's chest sticks too far out in that pose.) Also it'd be cool to see a 3D Robored. That was always one of my favorite Keen characters. On a slightly different topic, all the download links for this seem to be broken. Dropbox is saying the files don't exist. @nanomekia: Thank you very much! That's true about the chest sticking out; I think the problem is that I have his back bent back, which looking at the box art is not the case-- something I need to tweak when I add Robo Red. Thanks! So for the next update I post, I will need to look for a new file hosting, or have to go through Dropbox's stupid interface. As it is, I switched over to imgBB for image hosting for that same reason (as it was, I got tired of Photobucket, which is why I originally went over to dropbox, haha). 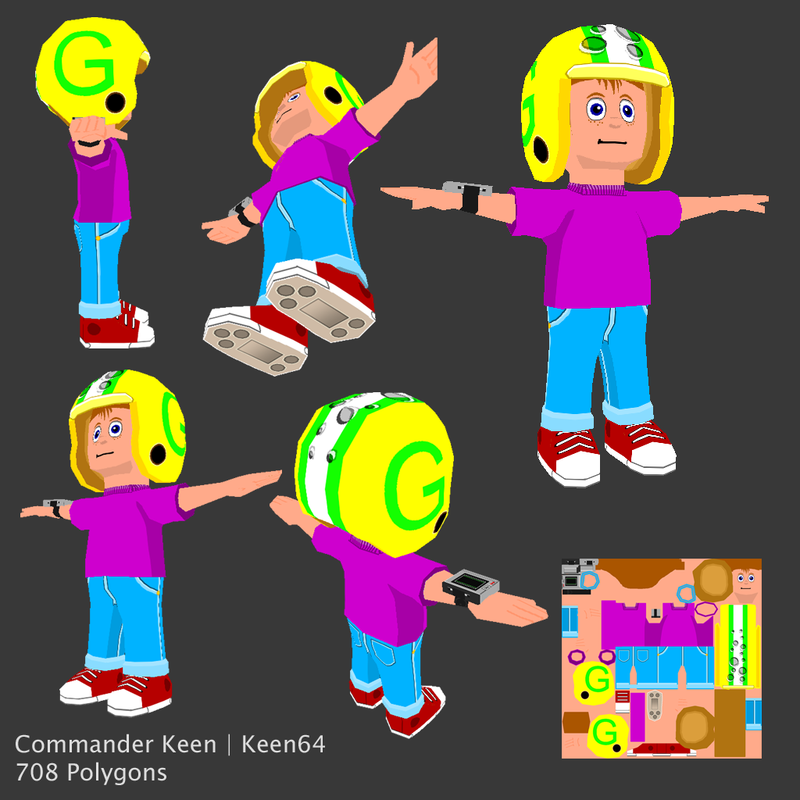 But in the meantime I re-uploaded images from my previous post, when I first made the new Keen model. I highly recommend Imgur for image hosting. I personally really liked the simplicity of Dropbox's Public folder, but at least you can still share without using the web interface - right-click a file in your Dropbox folder and choose Share; you can create a public link with that dialog.